Today’s COTD is the new Aqua Force key unit! 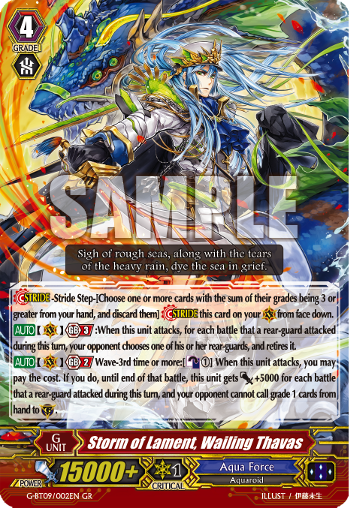 [AUTO](VC)[Generation Break 3]:When this unit attacks, for each battle that a rear-guard attacked during this turn, your opponent chooses one of his or her rear-guards, and retires it. [AUTO](VC)[Generation Break 2] Wave-3rd time or more:[Counter-Blast 1] When this unit attacks, you may pay the cost. If you do, until end of that battle, this unit gets [Power] +5000 for each battle that a rear-guard attacked during this turn, and your opponent cannot call grade 1 cards from hand to (GC).